Manchester United manager, Jose Mourinho is already looking to the future despite our title-winning morale being dampened at Stamford Bridge on Sunday. Chelsea beat United 1-0, a game which has been highlighted for the manner in which we set up to play and the handshake snub by Chelsea boss, Antonio Conte on Mourinho. United were simply outclassed for much of the duration of the clash and José has to use this international break to reflect on the way forward after a run of just a win in four league matches and also to run the rule over a number of stars returning from long term injuries. The trio of Marcos Rojo, Zlatan Ibrahimović and Paul Pogba are all expected to step up their rehabilitation during the international window and Mourinho believes they could be back when Newcastle come visiting on November 18. 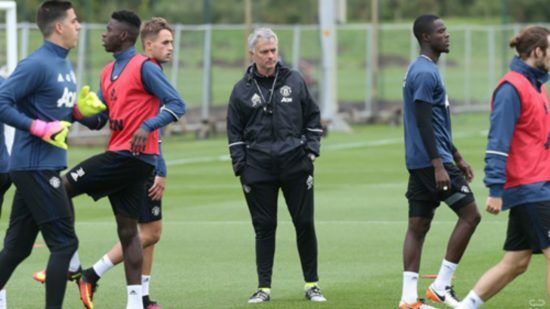 The pair of Rojo and Ibrahimović got injured in the Europa League quarterfinal second leg match against Anderlecht last season as they suffered nasty knee injuries but both players have already begun light training as José looks to ease them back to first team action. Pogba on the other hand was instrumental before suffering an hamstring complaint back in September during the first half of our opening Champions League game against Basel. Mourinho has given an update about the fitness of the trio as he spoke to MUTV. He said, “We have the group of players which are the ones that we hope will recover as soon as possible. “They have to work every day but they are in a good position now. Pogba, Ibra, Rojo, Fellaini. They are in good positions so I think we can go into this part of the season, the Christmas period, and after, in a strong position.” He added. The return of all three could be the tonic we need to get our season back on track. Zlatan can’t come sooner as Romelu Lukaku has not scored since the end of September while Rojo is needed at left back since Ashley Young is not the right fit at that department. Pogba was particularly good at the start of the season having been liberated from the defensive shackles placed on him last season as Nemanja Matic has come in to steady the ship.